With 9,641 visitors and 261 exhibitors, analytica Anacon India, India Lab Expo and Pharma Pro&Pack Expo has reached the best results in its decade-old history. The number of visitors rose by 25 % compared to the previous edition. Hyderabad/India — Visitors from pharmaceuticals, chemicals, food processing, research and development among other segments explored the latest innovations from the laboratory technology, analysis, biotechnology, diagnostics, pharma packaging and processing. Almost all top companies within and around Hyderabad attended in large numbers and delegation trips were arranged by Messe München India for several companies. Dr. Reinhard Pfeiffer, Deputy CEO of Messe München, is pleased with the positive results and with the positive feedback from the exhibitors on the quality of attendees. As an example, large delegations from the Pharmaceutical Manufacturers Association and the Indian Drugs Manufacturers Association attended. “We organized the conference to cover advancements in analytical solutions for life sciences," Gautam Rajan, President, Indian Analytical Instruments Association on Anacon India conference said. This was a very relevant topic today, because the future of research and instrumentation lied in this industry, he added. There were many changes taking place and this conference addressed these changes and how the industry will cope with them. The analytica Anacon conference which took place on the opening day focused on Advances in and Analytical Solutions for Life Science Research, where industry stalwarts shared deep comprehensions about the state-of-the-art development in the analytical industry. The esteemed speakers deliberated upon topics including Evolution of Life Sciences, role of advanced analytics, new methods for Bio Molecular imaging, advanced analytics for biosimilar development: addressing safety and efficiency concerns and many others. The Smart Lab Summit, which took place on the second day of the event focused on the theme ‘Building your lab for tomorrow’ where prominent speakers from Aurobindo Pharma, Dr Reddy’s Laboratories, Lupin Limited, Reliance Life Sciences, Wockhardt and others deliberated on the need to move towards the smart laboratories, the need for investing smartly in Labs, transforming Laboratories through Big Data, and understanding the future of workforce in Smart Laboratories. Buyer-Seller Forum proved to be another important networking platform where 912 face-to-face meetings took place in three days, an increase of 7 % from past edition. 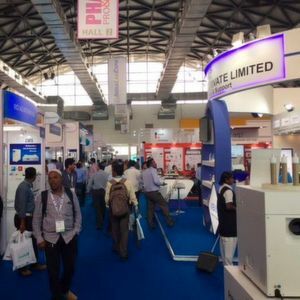 The next editions of analytica Anacon India & India Lab Expo will take place in Mumbai (16–17 April, BEC) and Hyderabad (19–21 September, Hitex) in 2019.